Such as baby carrots, fine green beans, asparagus spears, radishes, cucumber, celery, spring onions, baby corn, courgette, sweet pepper, cherry tomatoes, broccoli or cauliflower. 1. To make the dip, place the beetroot in a processor or blender and add the cream cheese, feta, honey and lemon zest. Blitz until smooth and season to taste. This can be made up to three days in advance and kept covered in the fridge. 2. Spoon onto a serving plate or wide, shallow bowl, spreading it evenly. 3. 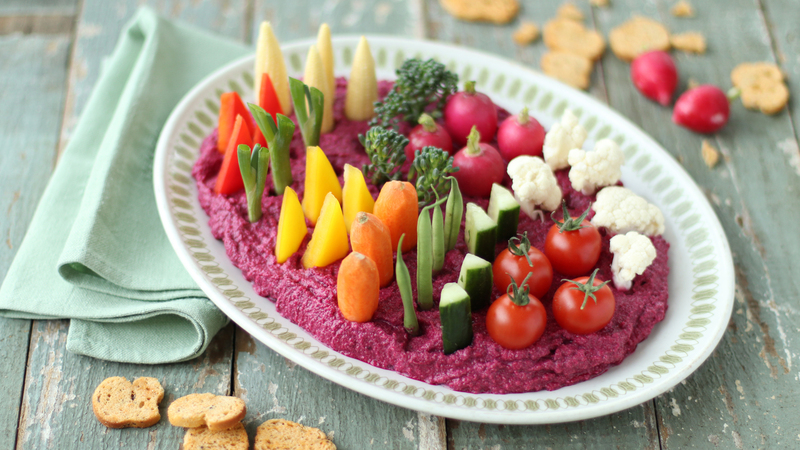 Arrange a selection of vegetable crudités in rows or sections sticking into the beetroot dip. This can be assembled up to one day ahead and kept covered in the fridge until ready to serve. Alternatively, serve as individual portions in little glasses, glass jars or pots, sticking the veg out of the top.